I Can Cook! American Food is a cook book, history book and travel book rolled into one. Wendy has chosen traditional American recipes that kids will be running into the kitchen to cook: hamburgers, blueberry muffins, pancakes (no one does pancakes better than the Americans), homemade lemonade, apple pie and, of course, peanut butter and jelly sandwiches. The layout of the book is exceptional, full of colour and information, and budding young cooks will find it easy to read and follow the instructions. Each recipe is laid out with each step in its own text box and with accompanying photograph/graphic. The recipe is introduced with a brief history of the food. All equipment and ingredients required are listed as are prep and cooking times. The addition of information on special diets for either health or cultural reasons is highly commended. Experimentation is encouraged with each recipe with suggestions for variations and a Try this! 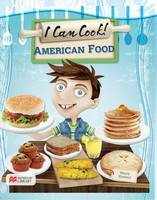 section which suggest activities to learn more about American food. Cooking basics and safety in the kitchen are explained with text, photography and graphics. For me, what makes this book stand above other children's cook book is the additional cultural, historical and geographical information included about America: the influence of native Americans and migration on contemporary American food, regional variations, American produce, landscapes and climates, and the American celebration of Thanksgiving. Wendy Blaxland's marvelous six book I Can Cook! series also includes titles on Chinese, French, Italian, Mexican, and Middle Eastern Food with each of these following the same format.